There figures to be a contested pace in this contentious race, with last year’s winner The Lumber Guy, Private Zone and Forego winner Strapping Groom all confirmed need-the-lead types. The Lumber Guy enters off a second place finish to lesser (92 Beyer, beaten by today’s foe Palace) following a long layoff in his last, and doesn’t appear to be in the same form as last year. He’ll need a massive jump in his second race off the lay off to make an appearance on the board here, and we will try to beat him altogether for the repeat win. PRIVATE ZONE should enjoy his outside post away from the speed, and also showed a nice tuneup in winning his last over a polytrack surface, also after a long layoff (96 Beyer). He was competitive early in the year, running 2nd to the high class Sahara Sky in the 6f Palos Verdes, and a return to that form makes him a threat here as he rounds into form following a tough trip to Dubai in the winter. Of the pace horses, we like his chances to hit the board best. Strapping Groom may have benefited from a sloppy, speed favoring track in his Forego upset but looks to be a contender based on speed figures (104 Beyers in two of last three races) and has a win over the Belmont surface. However the feeling is that he may be due for a bounce, and will see stiffer foes on the lead as he runs inside all the speed. Conventional wisdom based on the hot pace might point to Forty Tales, the best closer in the field, but we still feel he needs a bit more ground to make his full impact, and he was uncharacteristically flat in his last. He’s still usable underneath, however, and defensively in multi-race wagers. What we are looking for here is a horse that will sit just off the leaders, and we find that in BAHAMIAN SQUALL. He’s been a different horse since learning to sit off the pace a bit, winning the Smile Hcp (101 Beyer) and finishing 2nd after a tough trip in the Vanderbilt in his last outing, both at this distance, and actually shows the highest last race Beyer off that effort (105). The horse that bested him in that race, JUSTIN PHILLIP, will be a tough competitor here as well off of that showing (109 Beyer tops the field overall), but the feeling is that the seven weeks of rest will benefit the top pick, while Justin Phillip comes in off a tough 3rd place finish over the slop just four weeks back in the Forego (97 Beyer). The much improved LAUGHING comes off three straight front-running wins at the 8.5f distance (94,95,96 Beyers), and should see a similar setup here as she stretches out to 10f for the first time with very little speed signed on besides her, and no superior Euros shipping in from over the pond. Lone speed stretching out for the first time on turf seems to be a very playable angle in general (paging Little Mike circa 2012), so we’ll use it here. If she’s unable to hold on, a likely upsetter could be her stablemate TANNERY, who won the 11f Sheepshead Bay (90 Beyer) from off the pace and finished a respectable 4th against the boys in the 12f Sword Dancer following a disappointing 8th in the 10f New York Stakes. Another horse that could get involved late is QUSHCHI, who comes off an impressive win in the 12f Waya Stakes (92 Beyer). She may need a bit more ground to make her full impact however, and a likely slow pace up front won’t help her closing style. Mystical Star was in career form a year ago and did show an impressive win last out at a longer distance, but she’s been beaten handily by the above two this year. Somali Lemonade has shown some success from off the pace at the 8.5f distance, but finished a one paced 5th to the top pick in her last outing. Valiant Girl is a bit of a mystery, having won her last race in her first Stakes attempt at the 11f distance, but had run five straight allowance races prior to that, so this is a big class leap. Kissable seems relatively low on the ML at 5-1 considering she is unplaced in both starts this year, well behind Qushchi and Mystical Star, and longshot White Rose appears in over her head. In contrast to the Flower Bowl, there’s tons of speed signed on here, as four of the ten starters should be expected to battle for the early lead. Little Mike has truly come full circle after surprising wins last season, as his form has been bad enough in 2013 to merit 10-1 morning line odds here. He’s always struggled unless allowed to set easy fractions up front, so he’s tough to support coming off a 6th place finish in the Arlington Million while trying similar tactics. Imagining was impressive in his last, winning the 9.5f Idle Rich Stakes wire to wire, but the added pace here hurts his chances. King Kreesa has been successful at mile races, winning the Poker Hcp (103 Beyer) and finishing 2nd to Wise Dan in the Fourstardave and posting a similar number. However, this looks like a rough spot to try to stretch out by 50% for the first time. The same can be said for longshot Joe’s Blazing Aaron, who qualifies for rabbit status for his Ramsey stablemates coming off of four straight unplaced finishes in allowance company over races in the 8f range. The added speed only makes this race set up better for the aforementioned part of the entry. REAL SOLUTION was much the best in the Arlington Million despite needing a controversial DQ to get up for the win; he was gaining ground with authority and would have won by open lengths if not for being obstructed by The Apache. The 100 Beyer he earned there tops the field for last out figures at the 10f distance and beyond, and he has the look of a horse improving rapidly and begging for more ground. We feel he is the most certain winner on the entire card. The deep closing BIG BLUE KITTEN was impressive in winning the 12f Sword Dancer (96 Beyer) in his last outing, and should get a nice setup here. TWILIGHT ECLIPSE missed winning that race by a length, and ran a field high 103 Beyer when he won the 12f Pan American back in March, but hasn’t been able to duplicate that effort and we feel he may be cooling off at this point of the season, but must be respected. The same negative trajectory can be assumed with much more confidence regarding Boisterous, who is probably better at shorter distances but shows two consecutive descending Beyer figures and will be making his 5th start in the last 3.5 months. Slumber takes a class leap coming off of two 9.5f victories in allowance company, and Nutello will try to improve upon a decent 3rd in the Sword Dancer in his second start on American soil. The big question in the biggest race of the day will be whether Morning Line favorite Cross Traffic can get the 10f distance in his first attempt. The 4 year old colt has been brilliant on the lead, most recently when scoring in the 9f Whitney against top competition. We tend to pick against horses in this spot, especially when pedigree suggests that the classic distance may be an issue, and will do so again here. While Cross Traffic isn’t necessarily a toss based on pedigree (Mr. Prospector sire line), his dam side is certainly more geared towards speed. He’ll definitely go right to the lead, but could face some pressure from Woodward winner Alpha and the wildcard Brazilian horse Vitoria Olimpica unlike what he’s been accustomed to. We will focus here on the two horses that have shown affinity both for distance and this particular racetrack. PALACE MALICE seems to have the most upside, as just like his sire Curlin before him, he has really turned it on following the Triple Crown season. After winning the 12f Belmont Stakes over this track, he posted an explosive 107 Beyer when winning the Jim Dandy in professional fashion. His 4th last time out in the Travers was much better than it looked and he was probably the best in that race, as he sat too far off a slow pace which goes against his running style. He still managed to close ground and finish less than a length from the winner, posting an impressive 106 Beyer, which is tied for the highest in the field at 10f or beyond this year. Plenty has been said about FLAT OUT, who loves this track and will seek his third consecutive win in this race. He was game when 2nd last time out in the Woodward, but hasn’t raced at this distance yet in 2013. Still, leave him off the top line at Belmont at your own peril. The three year old entrants have ran 10f or beyond three times each, and may hold a seasoning advantage along with their comparable speed figures. Kentucky Derby winner ORB seems to always fire, but he hasn’t showed the same turn of foot since that big win. He looked to have the advantage turning for home in the Travers, but simply couldn’t get past Moreno or hold off Will Take Charge. He may have needed that race from a fitness standpoint, though, and stands a chance here. An overlooked horse could be Last Gunfighter, who also likes to stalk and pounce late, but he will be taking a big class jump here. He was soundly beaten by Flat Out over this course in the Suburban. The deep closing Ron the Greek is still trying to get on track this year, and after spending enough on him over the last 6 months, I’m content to concede that his better days are behind him. He needs a super hot pace to make his full impact and we don’t anticipate that being the case here. Earlier last month I found myself sitting outside on a Friday afternoon on Randolph Street at Maude’s Liquor Bar, the latest hot spot from Brendan Sodikoff (of Gilt Bar fame) in Chicago. Styled as a noveau French Bistro, the restaurant offers as a special one of the most unique Cassoulet dishes I’ve ever had anywhere, Paris included. August isn’t exactly Cassoulet season, but this dish consists of full pieces of garlic sausage, marrow, duck confit legs, huge chunks of carrots, and cooks the pork belly across the bottom of the massive entree. It is a dish meant to be shared or taken as leftovers, and even at its $34 price point, it stands as a relative bargain for the sheer quantity of food combined with its intense and authentic flavors. This is very true to the French style, and a gut buster to boot. I even made a return trip later last month and ordered it again after a huge score at the Arlington Million along with another dedicated foodie and close friend. When making the decision to embark on such an endeavor, a French wine is mandatory, and Maude’s offers no shortage of these. Rhone enthusiasts far and wide are aware of the success of the 2010 vintage (read my full report from my tasting trip to this region last spring here). I spotted a particular Cotes du Rhone that I had yet to taste on the menu, and was pleased with the pairing choice. More than anything, I was reminded how remarkably priced these table wines can be, especially in landmark vintages, and how short lived they are. There will be a day, far sooner than I would like, where you won’t ever see a 2010 Cotes du Rhone on a menu ever again. Time is of the essence, so saavy wine enthusiasts should be keen to notice these wines while they last. 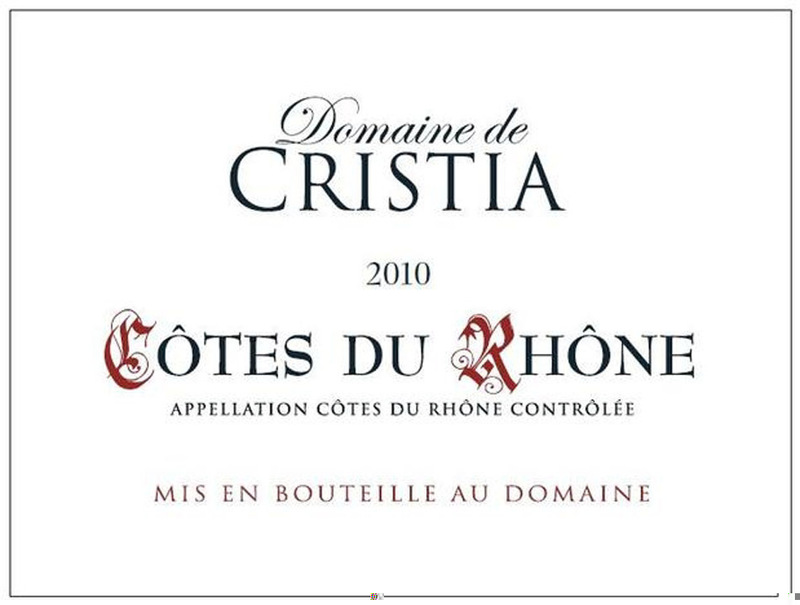 DOMAINE CRISTIA COTES DU RHONE 2010, 90 Points, $20, 1250 Cases Produced- Ripe and appealing on the nose, with fragrant crushed berry fruit and floral notes. This shows polished cherry, raspberry, boysenberry and red licorice flavors above layers of wet slate and spice. Long, gripping finish.